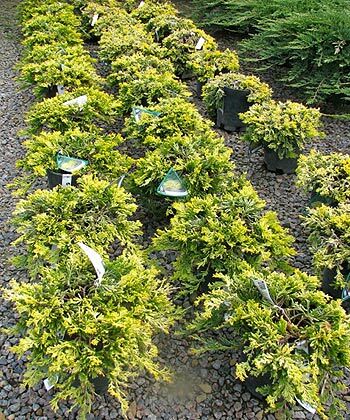 What a sweet little creature, a golden-yellow, extremely low-growing (6-8”) juniper that grows outward to six feet. This is a great plant to use as a groundcover in sunny, open areas. Plants require full sun, and decent soil with adequate drainage. It’s a Juniper, so once established, it will handle baking midday sun and fairly low-volume watering. Once established, that is. Plants benefit from a spring feeding of granular tree/shrub fertilizer. The plant is hardy to Zone 3 and doesn’t mind being covered by feet of snow in winter. In areas of the country where snow isn’t a constant part of the winter scene, plants do a nice job of retaining their golden-yellow color. One advantage of the plant is that small secondary branches that inevitably die and turn brown are easily spotted and removed. The plant can be pruned to keep it from eventually growing across a sidewalk or out into lawn. After five years in the ground, you could prune it into a star, or the shape of your state, if you wanted to. I like to use the plant amid green and blue evergreens, giving plants enough space to create a golden blanket that acts like a decorative skirt around a Christmas tree. ‘Mother Lode’ can be used as a single, or massed for larger areas. 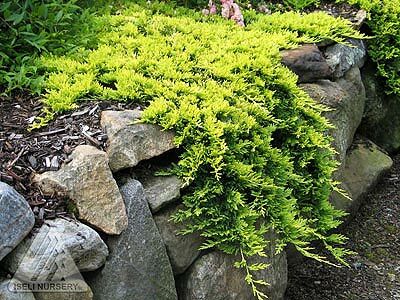 The plant also is spectacular planted along a stone or boulder wall, where it can drape over the edge like a waterfall.